Calling all fans of great country! The band that brought you “Chicken Fried,” is back – that’s right, it’s the Zac Brown Band, on an enormous North American tour once again in 2018!! 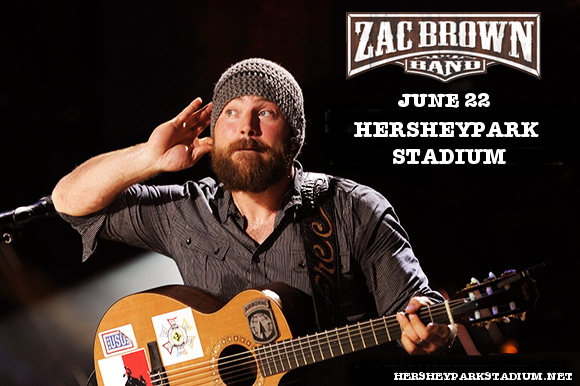 They’ll be performing LIVE at the Hersheypark Stadium on Friday 22nd June 2018 – no country lover can afford to miss it!! Tickets will disappear fast so be quick on the “Buy Tickets,” button to be sure of your place at the show!! Formed in 2002 by core band member Zachary “Zac” Brown, the Zac Brown Band has gone through various incarnations, with new members joining all the time to form today’s perfect lineup, complete with the banjo and mandolin! Since their smash hit debut major label release “The Foundation,” in 2008, the Zac Brown Band have been unstoppable, hitting the top of the charts with one incredible single after another, including but not limited to “Knee Deep,” “Sweet Annie,” As She’s Walking Away,” and “Toes”! Join the family live on Friday 22nd June – get your tickets today! !